"Laurel Ridge, Bridgeton, RI. Hopkins Machine Shop on left--Laurel Hill" by J. P. Davis, Pascoag, R.I.
Used; Postmark: November 16, 1907. J. P. Davis, Pascoag, R.I., "Laurel Ridge, Bridgeton, RI. 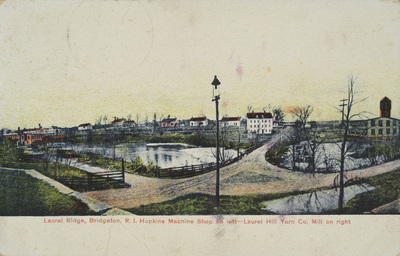 Hopkins Machine Shop on left--Laurel Hill Yarn Co. Mill on right" (1907). Rhode Island Postcards. 313.